2018 was a great year for drone enthusiasts. 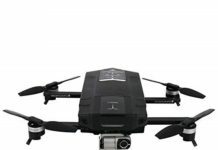 This is the year when the Mavic 2 was released. Other additions to the industry released in this year included the Halo Stealth Pro, Parrot Anafi, Autel Evo and others. How will 2019 turn out? That remains to be seen. However, if you need the best drone for adults, you can go for the Potensic D80 GPS FPV RC drone. It was designed with futuristic outlook as it incorporates many features that even the drones of 2020 will have. 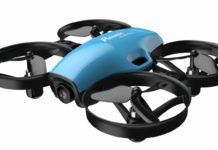 It is affordable and it is good for both beginner and advanced drone enthusiasts. However, please note that this drone is best for adults. 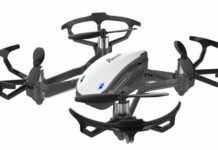 The Potensic D80 quadcopter is a camera drone, with a 1080P camera that takes good video and photo footage. You will need a memory card to store your footage so that you can transfer it to your computer later. However, you can also view the footage in real time on your smartphone. Just use FPV mode, which connects through the 5.0 GHz module. It brings you 1080P transmission over a range of 500 meters maximum. About design and construction, this is a brushless motor drone, with four powerful motors. One thing about brushless motors is that they do not spoilt fast, need minimal maintenance and they fly quiet. 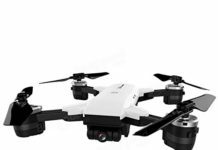 This is a fast drone, as can be expected from a brushless motor drone. It has a high flight speed at 25 mph. That is high, but it still takes good footage even at that speed. However, as a beginner, it would be better for you to start with a lower speed setting and then grow to a higher speed later. With the controller, the control distance increases to 600 meters. This holds true unless there is a signal interference of sorts. Of course, with the dual-GPS feature, you need not worry about the safety of your drone as there is auto-return for low power and signal loss. The battery of the Potensic D80 will last an impressive 20 minutes. 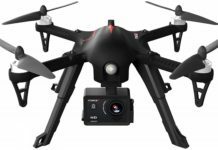 This is much longer than the typical 12 to 15 minutes that most of the other drones in this price range last. Running on a 7.4V 1800mAh Li-Po battery, you can buy spare batteries and fly it for much longer than 20 minutes. Being a modular battery, you can charge it alone while you fly the drone with another. Charging time is long though at 5 hours. With headless mode, this drone will fly in any direction. This is a very good feature for beginners. It means they do not have to figure which direction the nose of the drone faces. Just press the button for headless mode and the drone will start flying right away. You can plot the route that you want the drone to follow on the smartphone. 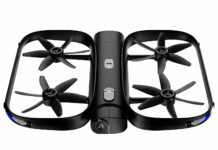 This leaves your hands free and gives you an exciting drone flying experience. You will love using the one key landing and takeoff feature. Once you press that button, the drone takes off immediately and it rises vertically to a height of 15 meters and hovers there. If it is mid-flight and you press the button, the drone goes back to the launching point. Talking about hovering, the Potensic D80 also has hovering mode. It will stay at your preset level taking videos and photos. Register the Potensic D80 with the FAA before flying it. The Potensic D80 is a very advanced drone, no matter what the reviews say. I was not keen enough to set the speed properly and within a blink the drone flew out of sight. I stopped it by hitting the landing button. Jess P.
I have no regret after spending a couple of months with this drone. Even the long charging time, I feel that is well compensated for by the speed and other features. Tyrone G.
This is one of the best drones that I have ever flown. I felt that the price was way too high, but now that I have used it, I do not regret at all. I would buy it over again. Mickey Q. With a top speed of 40 km/h, I love me a good thrill of speed whenever I can get it and this drone does it for me. I love the video quality too. I have used it to take some good footage around my yard. Neil W.
I found this drone a bit of a challenge to start flying but once I got the hang of it, I have never looked back. This is my second Potensic drone now. Trudie M.
Because of the brushless motors, this has been a good drone for close to a year. Never gets hot and there has never been any need for repair. However, I do not fly it too often. Franky G.
Who Should Buy The Potensic D80? The manufacturer recommended age for users of this drone is 25 years. 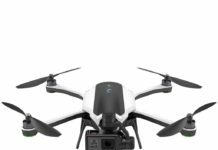 This is a fast drone and therefore it is best suited for advanced drone pilots. However, for a cost of less than 300, you will never regret investing in it. 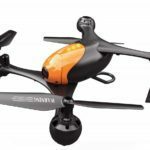 If you are looking for a drone for keeps, this is it for you. It has many features, can fly quite fast, and is very stylish in design. The Full HD, 1080P camera shoots good footage. To enjoy longer flight time with this marvel of technology, buy one or two spare batteries. The charging time for one battery is 5 hours. Set the speed first before you start flying the drone because it can take off so fast you would not know what happened. It is also recommended that you read the user manual of the Potensic D80 drone before you can start flying it. 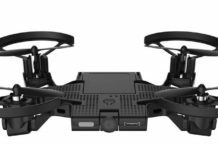 This is not called the best drone for adults for nothing. It is because of the high speed and performance.